View down High Street from outside old Rectory. Photo courtesy of V. Hopkinson. I was born in the bottom house of the terrace on the right in 1937. The house was the home of my grandmother who lived there until around 1938. The houses at that time belonged to one of my great uncles. My aunt lived in one of the houses until the mid 1990s when approaching 90 she was moved into a home. 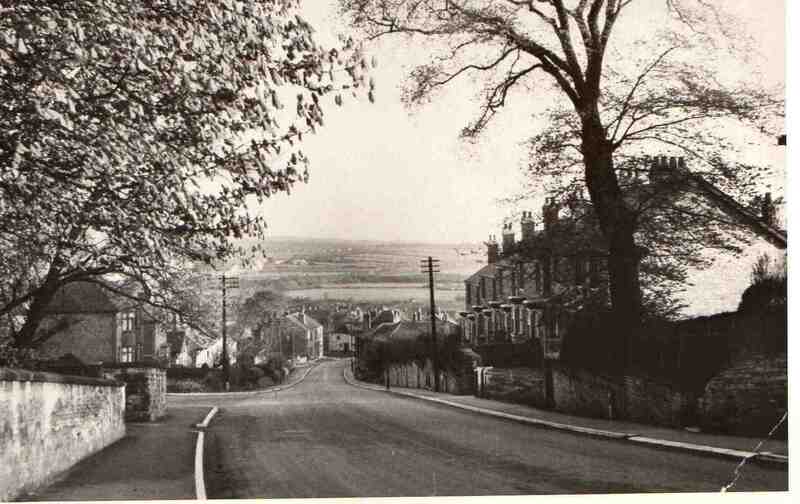 The photo was taken after the access road on the left to a new housing estate was built sometime during the 1950s I believe. Before that, there was a footpath that led across the fields to The Dell and beyond to join the track between Westthorpe and station road, a regular walk for us in the 1940s. Wow another photo of our tree.Its becoming famous.Taken from the other side of the road really shows it up well.I remember the day it was taken down the old fellows who lived in the houses below sitting on form other side of the road muttering and shaking their heads about how long it had been there. they didnt have to live with it.